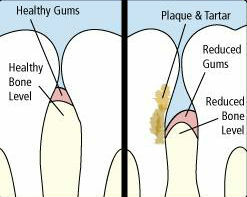 Gum disease affects your general health! People with periodontal disease may be at 2-3 times the risk of having a stroke (brain attack) compared to people without periodontitis. Dental X-rays help dentists visualize diseases of the teeth and surrounding tissue that cannot be seen with a simple oral exam. Bad breath is also called halitosis. It can be an embarrassing problem, so some people don’t want to talk about it. Bad breath can be caused by many different things. One thing is for certain no one likes it. What you can do about it! Most cravings are actually misinterpretations from our bodies that we are dehydrated. By drinking a tall glass of water first, you may be giving your body exactly what it wants and alleviate the craving altogether. By some estimations, 80 percent of people are chronically dehydrated. So, before you reach for food to nix your cravings, quench them with some water. Then wait half an hour. More often than not, they’ll be gone. 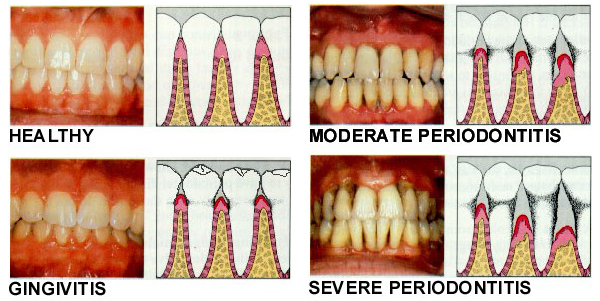 The first symptoms of periodontal disease may not be easy for you to recognize. It isn't too difficult to overlook your bleeding gums and bad breath— especially if you're a smoker — because these symptoms often come and go for long periods of time. But these early warning signs may indicate bigger problems ahead. Periodontal disease often starts as gingivitis, a bacterial infection that causes inflammation of the gum tissues. If left untreated, this condition can progress to periodontitis, which results in loss of the bone that surrounds the teeth. When bone tissue is lost, the teeth and gums begin to separate, forming pockets that provide an ideal environment for bacteria to thrive. Ultimately, the disease may cause tooth loss, painful abscesses, and even systemic inflammation. Brushing and flossing daily, and having regular professional cleanings are the best way to prevent periodontal disease. If it does develop, a number of treatments are available. Evaluating your oral hygiene techniques and seeking to improve them is a first step at control. Your dentist can also remove plaque and tartar with special tools, in the cleaning technique called “root planing” or “root debridement.” In some cases, periodontal surgery may be necessary. Teeth Whitening works by exfoliating stains from inside your teeth to bring them back to their natural color. 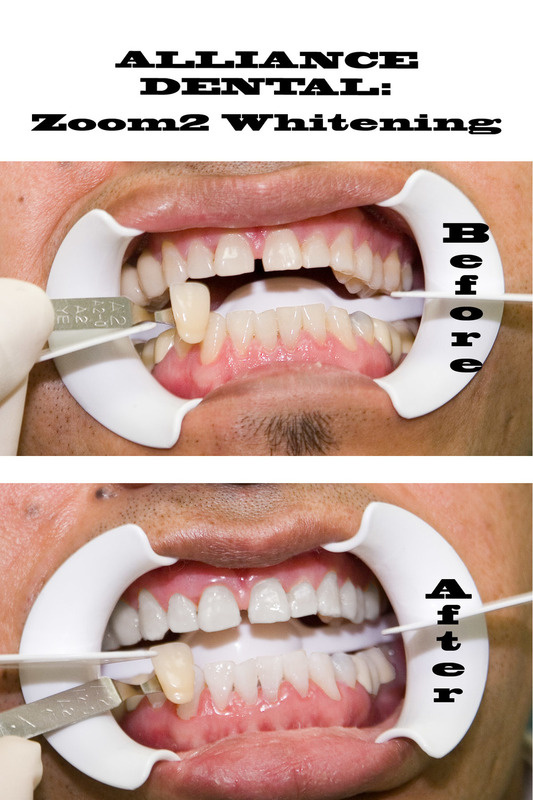 Zoom teeth whitening is a process that uses a 25% hydrogen peroxide gel, the gel is activated via a special UV light. Your eyes, lips and gums are completely covered and protected throughout the entire procedure. Whitening is considered one of the safest procedures available in dentistry. The procedure consists of three 15-minute sessions. A fresh layer of whitening gel is applied after each session as the old gel is removed from your teeth. Whitening results can not be predicted. The process can give different results for different patients. That being said, in our recent office study of all patients who had the whitening procedure in 2013, we have seen an 8.5 shade difference after three 15-minute sessions. Before the procedure is started, we will measure your initial shade, and at the end of the procedure Our most successful whitening sessions resulted in 15 shades difference, while our least successful cases (very small number of patients) only got 4 shades lighter. Have you ever seen someone with teeth that look like chiclets? Since the whitening process removes stains to bring out the natural tooth color, the results after in-office whitening will always look natural. Your smile will look natural and healthy. Crowns and veneers are made of porcelain, bondings are made of curable resins the shades of which can not be changed. If you have had any previous cosmetic dental work, please know that the color of these restorations will not change. This does not necessarily mean that all is lost and you should not whiten your teeth. On the contrary, don't forget that these restorations were probably done some time ago when your teeth were lighter. Years of drinking coffee, red wine, tea, as well as eating foods that stain the enamel have darkened your teeth and your restorations are probably lighter than your current shade anyway. You always have the option of stopping the whitening after each 15 minute session. If you are unsatisfied with the color of your previous restoration, you may consider replacing it after your whitening. Although zoom teeth whitening is a very safe procedure. Doctors in general do not recommend any elective cosmetic procedures for pregnant women. Even if the risk is just 0.000001% it’s still something that’s not worth taking. There has not been any harm ever reported, it’s just not a risk worth taking. Additionally, because whitening uses a UV lamp to activate the whitening gel, whitening is not recommended for patients who use photo-reactive medications. For a limited time, put one of these back in your pocket. Call before May 31st to book your appointment. What are the consequences of delaying a root canal? Having tooth pain can be debilitating. Even though some tooth discomfort can be caused by sensitivity to hot and cold, a toothache is more often a sign there's a problem, like a cavity, that needs attention. Although there are over-the-counter medications that can mask tooth pain, delaying a trip to the dentist when there are indications of a problem is never a good idea. There's a difference between a simple cavity and the kind of infection that requires endodontic (root canal) treatment, though. In the old days before modern advancements in dental care, it was the difference between keeping a tooth and having it extracted. Today, diseased teeth can often be saved, but not always. Before we talk about the consequences of delaying a root canal, let's take a look at the type of infection that requires endodontic treatment [source: ADA]. The exterior of a tooth is hard and looks pretty indestructible, but deep inside it has a spongy core made up of soft tissue called pulp that contains nerves and blood vessels. The pulp extends down to the base of the tooth. In a perfect world, the pulp should be safe inside its enamel reinforced exterior, but because the human diet can be high in foods that attract and nurture bacteria, the pulp can sometimes become compromised. When the pulp becomes infected or injured, it has no way to protect or heal itself. This means that if a dentist recommends a root canal procedure, there's no upside to postponing treatment. An infection in the pulpy core of a tooth won't get better. It will only get worse. The destruction of the pulp inside a tooth can result in tooth loss. Delaying treatment can also lead to an abscess near the root or tip of the tooth that can be excruciatingly painful, cause swelling of the face or neck, lead to bone loss in the jaw, or actually create a hole in the gum or cheek area that will leak pus and other fluids. There's something else to consider, too. Postponing a root canal procedure can also lead to a serious condition called septicemia, a localized infection (like an infection inside a tooth) that spreads to other areas of the body like the heart, brain or lungs. Although rare, septicemia can be life threatening.